Within certain limits the the Buddy List can be ordered. This page says how. So you have added a few Buddies and you want them to appear in a different order. You can see that it says "Sort By Availability" with a tick next to it. You can also apply a two pass method of selecting one of the Alphabetical options then the "Sort By Availability" to have an Alphabetical List with the Available ones at the top. Buddies can be in one of 4, visible to you, states. Green as Available, Amber (orange) as Idle, Red as Away and greyed out as Not on Line. 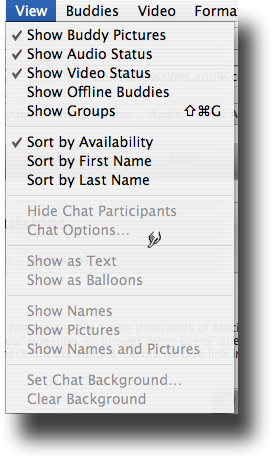 There is an additional selection to decide whether to display Off-Line Buddies or not at the top of the View menu items. Notes: Idle is when a Buddies computer is on and iChat is logged in but they are not touching any input device such as the Mouse or Keyboard, and will show after 10 minutes of non input even if their computer is rendering a video clip for example. By default iChat will be set to the Available setting although in iChat 2 this setting could get lost and no ticks would show and the list would appear to be somewhat random. Notes: You can not drag the Buddies into the order you want - you are constrained by the choices in the View Menu. 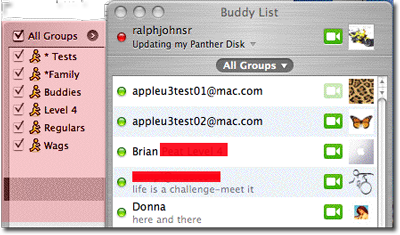 iChat version 2 does not allow you to order your Buddies into Groups either, although the Groups can be turned off one at a time to leave only some Buddies visible. The Drawer can be turned Off/On in the View Menu item Show Groups above and the whether the drawer is In or Out by the grey highlighted item in the top bar of the Buddy List in the picture above. Group names can be Edited via the Plus symbol at the bottom of the Drawer when it is out. This also allows you to Add new Groups. The process works by the fact you may only want to have contact with some particular Buddies so you turn the other "Off" leaving only those in that group showing. Buddies are added to a Group by dragging them to the required Group. Buddies can be dragged to more than one group. However at the time iChat 2 came out the limit of Buddies was 200 and having a Buddy in more than one Group makes them get counted as many times as the groups they are in. It is worth checking now and again by turning the Groups Off and checking each one in turn that they contain the "right" people. By turning all Groups Off you will see which Buddies have not been put in a Group. Using Groups does not re-order the list in anyway. It works by excluding those Buddies in other Groups when you turn them Off.